I was going through my things and found a piece of information I vividly remember reading and highlighting two years ago. I was very excited to see something I already intuitively grasped written in the ‘Optometric Clinical Practice Guidelines ‘ for dealing with ‘Accommodation and Vergence dysfunction’. What an emotional moment it was. I was excited and somehow releaved… I was not going completely insane. At the same time I felt cheated by every doctor I had ever seen and a lot of work was left to be done under difficult circumstances. But at least someone in the world knew what they were talking about and that’s something. It’s amazing… All this information is freely available online and no one seems to care about it! To get back to my excitement… Lately I often use the phrase ‘my vision is leveling out’. By this I simply mean that I possess the reflexes to maintain eye alignment and a clear image the overwhelming majority of the time. Also while doing funky head turns, running, playing basketball, … The whole caboodle. Until I get really, really tired or tense. Let’s say that if vergence scored 20/100 on a random, relative scale two years ago, it now scores 100/100 in comparison. I just about get by for simple, daily living. I have more control over accommodation too which is great for the syncing up process, although my prescription has not radically changed. Alright, so from the inside of my head the visual dysfuction is less blatant than it was two years ago. Mostly undoubled vision unless you put me in a stressful situation (like reading more than 20 minutes haha). BUT as the paragraph states ‘Improvement of amplitudes is not sufficient’. 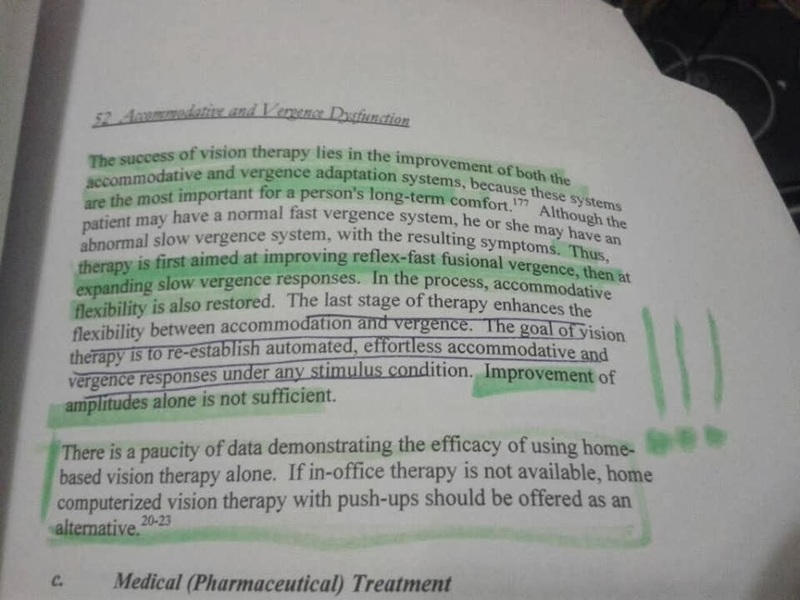 ‘The goal of vision therapy is to establish automated, effortless accommodative and vergence responses under any stimulus condition.’ 100/100 is not enough. To be comfortable you need ‘visual reserves’. You need more than just getting by. You need 200/100. You need to be able to maintain visual performance when things get tough. Not only that, you need it so you can actually focus on seeing rather than trying to see. As my VT friend Matan told me earlier, the most profound changes don’t result from improved eye movements. The most changes happen when you can execute those flawlessly and effortlessly. Then the perceptual and cognitive gates really start to open up. Based on the rather radical changes that have already been achieved over the last 3 years, I don’t see why that final goal would be out of reach. Ahhh man, this stuff is so exciting and it’s basically just a matter of time at this point! In a following post I’ll try to explain how the aperture rule or its computerized equivalents of cross eyed 3D pictures and parallel viewing stereograms are useful in cultivating ‘visual reserves’.